Of all the different types of fatty acids, only two have been declared essential to human health: linoleic acid (LA), an omega-6 fat, and alpha-linolenic acid (ALA), an omega-3 fat. The balance between these two essential fatty acids is delicate, however, and too much of one and too little of the other can result in deleterious health consequences. The standard American diet tends to skew the ratio of omega-6 to omega-3 in favor of omega-6 fats, which can contribute to a systemic inflammatory process and the increased prevalence of obesity, cardiovascular and nonalcoholic fatty liver diseases, rheumatoid arthritis, inflammatory bowel diseases (IBD), and cancer. To ensure clients and patients get the right balance of omega-3 and omega-6 fats in their diet, it’s important to review the facts about omegas, learn what the right balance should be, and understand how to best achieve it. The theory is that elongation of LA and ALA, if consumed in sufficient amounts, can produce longer-chain fats as required. The body can more readily use such fats, which include arachidonic acid (AA) in the omega-6 family as well as EPA and DHA in the omega-3 family. It’s still unclear whether LA and ALA’s own activity or the benefits from their elongation into AA, EPA, and DHA cause their essentiality. It can be argued that LA and ALA aren’t essential fats, provided that adequate longer-chain omega-6 and omega-3 fats are consumed. Some researchers claim it’s better to obtain more readily usable forms of omega fats, especially as EPA and DHA, considering humans’ poor ALA conversion rate. However, this topic is still up for debate. Omega-6 fats are necessary for normal growth and development. They help maintain the reproductive system and contribute to the synthesis of hair, skin, and bones. Main food sources of omega-6 fats include most vegetable oils (eg, corn, soybean, and cottonseed), nuts, and animal products. Omega-3 fats play an important role in cognition, behavioral function, mood, circulation, and skin and heart health. Although the ALA found in vegetable sources such as walnuts, flaxseeds, and chia seeds can, in theory, be converted into easier-to-use longer-chain omega-3 fats, it’s preferable to obtain EPA and DHA directly from marine sources, such as cold-water fatty fish (eg, salmon, sardines, herring, albacore tuna, lake trout, mackerel, sardines) and algae. As a consequence of these dietary changes, the current omega-6 to omega-3 ratio has reached an all-time high, estimated at between 10:1 and 20:1.2 The excess of omega-6 fats and the deficiency in omega-3s in the US diet is thought to be associated with today’s increased prevalence of chronic and inflammatory diseases. Omega-6 and omega-3 fats carry out essential tasks. Through their involvement with the synthesis of different eicosanoids, such as prostaglandins, thromboxanes, and leukotrienes, omega-6 fats tend to have a mostly proinflammatory effect, whereas omega-3 fats seem to elicit anti-inflammatory actions. Although excess omega-6 fats are associated with obesity, metabolic syndrome, and diabetes, they also can contribute to nonalcoholic fatty liver disease, which has been rising steadily in the past several years. Low-grade systemic inflammation is now considered a significant risk factor in the development of cardiovascular diseases. Eicosanoids derived from omega-6 fats are associated with many factors involved in atherosclerosis, such as inflammation, vasoconstriction, endothelial dysfunction, and platelet aggregation. Increased oxidative stress resulting from a high intake of oxidation-prone omega-6 PUFAs also can result in the formation of oxidized LDL particles, which are more susceptible to becoming incorporated into arterial plaques, eventually leading to cardiovascular problems. Many of the cardioprotective benefits of the Mediterranean diet can be derived from its more balanced omega-6 to omega-3 ratio, resulting from a higher omega-3 intake from cold-water fish and the liberal use of low omega-6 fats such as olive oil. It’s not always clear whether excessive amounts of omega-6s, inadequate levels of omega-3s, or both worsen these conditions. More studies are needed to determine the mechanism of action and confirm the beneficial effects in various conditions in which inflammation appears to be a key player. Despite the need for more evidence, RDs still can begin helping clients and patients make dietary changes to balance their overall omega-6 to omega-3 ratio, considering the safety and lack of side effects associated with such recommendations. Dietitians can suggest clients eat omega-3–rich, cold-water fatty fish two to four times per week. They should encourage marine sources of omega-3s over vegetable sources, such as flaxseeds, hemp, and chia seeds, considering the limited conversion rate of ALA into EPA and DHA. Conversion of ALA to EPA is estimated to be at most 8% in healthy adults, while conversion to DHA is significantly inefficient, varying between 4% to less than 0.1%, depending on the study.8 Research findings consistently show that increased ALA consumption can result in slightly higher EPA concentrations but doesn’t affect DHA levels. While it’s important to encourage clients to include more food sources of omega-3, fats to glean anti-inflammatory benefits, reducing omega-6 fats in the diet is the most effective strategy to balance the ratio. The risk of developing omega-6 deficiencies isn’t significant. 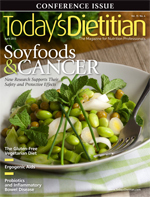 The only cases of omega-6 deficiency were observed in individuals consuming a 100% fat-free diet, as was previously the case in infants and children who consumed some infant formulas as well as in adults who received IV feeding preparations.1 Including healthful sources of fat from olive oil, avocados, nuts, and nut butters provides enough of the small amounts of omega-6 fats required for optimal health. There are several options for RDs trying to determine whether clients have the correct balance of omega-3 and omega-6 fats in their diet. They can suggest clients keep a food journal so dietitians can make an accurate assessment of the type of fats clients are consuming and the necessary adjustments. RDs can request certain lab values from their clients’ physicians to assess the impact of modifying their dietary omega-6 to omega-3 ratio. Knowing a client’s complete blood lipid profile, blood pressure and glycemic measures, and inflammatory markers (C-reactive protein level) at baseline can be a motivating factor for patients if significant improvements are made three to six months later. Dietitians can suggest clients avoid vegetable oils, such as corn, soybean, peanut, grapeseed, and sunflower as well as foods containing them. Salad dressings, mayonnaise, margarines, and other condiments are likely to be made with vegetable oils, so teach clients how to read labels and find suitable replacements. Educate clients on the important anti-inflammatory properties of omega-3 fats and provide tasty fish-based recipes for their weekly consumption. Restaurant food can be a significant source of omega-6 fats, so recommend clients suffering from chronic inflammatory conditions request the chef use olive oil when preparing their food to reduce exposure to omega-6s. If restaurants aren’t cooperative, clients can ask that their meals be prepared without any fat and bring their own extra-virgin olive oil to drizzle over their food to maintain an anti-inflammatory diet. Furthermore, encourage meat eaters to buy grass-fed varieties because of their higher concentrations of long-chain omega-3 fats (EPA and DHA).10 Their overall omega-6 to omega-3 ratio is more balanced and less inflammatory. Vegetarians should buy an algae-based DHA supplement to meet their omega-3 requirements, considering the poor conversion of ALA into long-chain omega-3 fatty acids. Without a doubt, fish oil supplements can play an important role in increasing intake of omega-3 fats. But as tempting as it may be for clients to take large doses of fish oil supplements to balance their dietary omega-6 to omega-3 ratio, it’s best they stick to the recommended dosages to provide the right amount of omega-3 fats and then correct their omega ratio by directly addressing their omega-6 fat consumption—preferably through whole foods. Patients suffering from a clotting disorder or those taking antihypertensive, anticoagulant, or antiplatelet agents should consult their physician before taking fish oil supplements. — Aglaée Jacob, MS, RD, is a freelance writer who specializes in diabetes education and digestive health, and is currently studying naturopathic medicine in Toronto, Canada. 1. Institute of Medicine Food and Nutrition Board. Dietary Reference Intakes for Energy, Carbohydrate, Fiber, Fat, Fatty Acids, Cholesterol, Protein, and Amino Acids. Washington, D.C.: National Academies Press;2005: 438. 2. Patterson E, Wall R, Fitzgerald GF, Ross RP, Stanton C. Health implications of high dietary omega-6 polyunsaturated fatty acids. J Nutr Metab. 2012;2012:539426. 3. Hiza HAB, Bente L. Nutrient Content of the US Food Supply, 1909-2004: a Summary Report. Washington, DC: US Department of Agriculture Center for Nutrition Policy and Promotion; 2007. 4. Hulbet AJ. On the importance of fatty acid composition of membranes for aging. J Theor Biol. 2005;234(2):277-288. 5. Dayton S, Hashimoto S, Dixon W, Pearce ML. Composition of lipids in human serum and adipose tissue during prolonged feeding of a diet high in unsaturated fat. J Lipid Res. 1966;7(1):103-111. 6. Hayakawa S, Yoshikawa D, Ishii H, et al. Association of plasma omega-3 to omega-6 polyunsaturated fatty acid ratio with complexity of coronary artery lesion. Intern Med. 2012;51(9):1009-1014. 7. Julia C, Meunier N, Touvier M, et al. Dietary patterns and risk of elevated C-reactive protein concentrations 12 years later. Br J Nutr. 2013:1-8. 8. Burdge GC, Calder PC. Conversion of alpha-linolenic acid to longer-chain polyunsaturated fatty acids in human adults. Reprod Nutr Dev. 2005;45(5):581-597. 9. Clark RM, Yao L, She L, Furr HC. A comparison of lycopene and astaxanthin absorption from corn oil and olive oil emulsions. Lipids. 2000;35(7):803-806. 10. Wood JD, Enser M, Fisher AV, et al. Fat deposition, fatty acid composition and meat quality: a review. Meat Sci. 2008;78(4):343-358.